The first step is to butter and flour a 9″ pan on the base and the sides and keep it aside. Melt the butter in a pan and add the brown sugar and keep stirring. Within a few minutes the sugar will melt and caramelize. The sugar will become frothy. Immediately pour the caramelized sugar into the pan and swirl the pan around so that it reaches all sides. Now add pineapple rings all around on top of the caramel base and set aside. Get the flour mix ready. Mix the all purpose flour, baking powder, baking soda and salt. In a big mixing bowl , beat the eggs, oil, sugar and vanilla for about 3 mins till it gets nice and frothy. Now add the flour mixture and the milk and fold it into the egg mix. Gently move all the batter on top of the pineapple slices in the cake pan. And smooth down the batter on top. Pop it in the oven for about 30-40 mins or until a toothpick inserted comes out clean. Let the cake cool down for about 10 mins. Using a thin knife, run around the edges once to ease the cake out. Place your cake stand on top and invert it all together. Serve it as is or with ice cream. 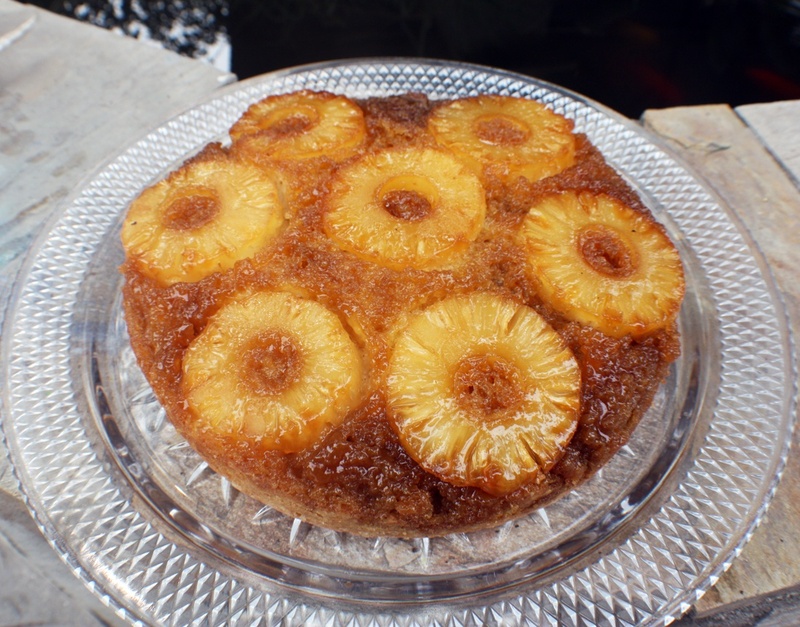 This entry was posted in Breads/Cakes/Rotis/Parathas, Desserts and tagged pineapple cake, Pineapple upside down cake by Kamakshi. Bookmark the permalink. I just wanted too ask you all, instead of pineapples, could you replace it with apples? get back too me asap, thanks.